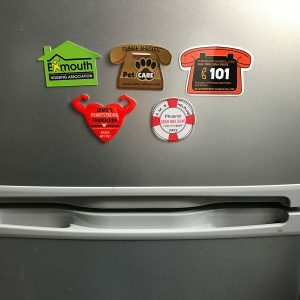 Using Fridge Magnets to promote your business – They always work! Fridge Magnets are one of the cheap and effective methods to capture and retain customers. If you haven’t already thought about investing in promotional fridge magnets, this is the time! Below are some of the facts that will make you rethink about your marketing strategy using cost effective and quirky Fridge Magnets. With other methods of marketing such as leaflets or mailing list there is always a chance that it does not reach the right audience or no one really even looks at it. But when Fridge Magnets are handed out, it’s almost certain that it would be used, even if it’s to prop up that take -away menu or the recent holiday picture. Fridge Magnets can leave a lasting memory on the mind. Studies suggest that the average person opens their fridge 15-20 times a day! That’s a lot of exposure when measured over a few months to years! Repeat exposure leaves a sense of familiarity, trust and brand consciousness. The next time the customer is looking for products or services you provide, you’ll be the first company that comes to his mind. Almost everyone uses Fridge Magnets as they can be used to attach notes, documents, pictures and serves as a showcase of everyday life. Magnets serve as a handy business card, all of your contact details can be on the Fridge Magnet for the customer to contact you. With numerous shapes, sizes, colours and materials available, it is not only easy to customise Fridge Magnets but also to stand out from competitors with quirky and colourful designs. They are inexpensive to manufacture and fit into every budget. You can give away your promotional Fridge Magnets to customers at events, pack into orders or hand out when you to meet them. They are so easy to distribute, target right people and make a lasting impression! Personalised Fridge Magnets are the easiest way to get what customer wants from promotional merchandising in a very short span of time. By creating a repetition, it serves as an effective time-tested reference. Order your bespoke fridge magnets now! We are one of the leading providers of high-quality promotional items such as fridge magnets, ties, badges, key chains , wristbands and more! If you are looking for bespoke personalised Fridge Magnets to promote your business, look no further!